Tobacco use can result in serious diseases and health problems including cancer, heart disease, lung diseases, pregnancy complications, and vision problems. Secondhand smoke exposure also can cause heart disease and lung cancer in adults, and health problems in infants and children. Preventing tobacco use and helping people who use tobacco to quit can improve health and quality of life for many Americans. 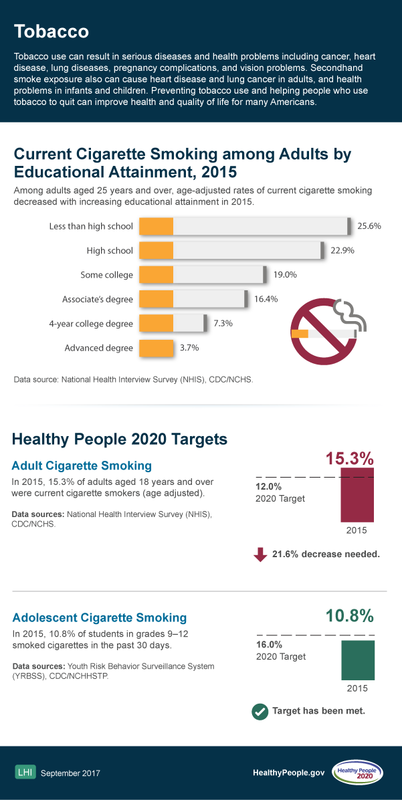 Among adults aged 25 years and over, age-adjusted rates of current cigarette smoking decreased with increasing educational attainment in 2015. In 2015, 15.3% of adults aged 18 years and over were current cigarette smokers (age adjusted). 21.6% decrease needed to meet the target. In 2015, 10.8% of students in grades 9–12 smoked cigarettes in the past 30 days.